Pre-ordering Dragon Quest VI will net you some slimy, blue hands in addition to a great JRPG. Square Enix made a surprising announcement in late December 2010 that Dragon Quest VI: Realms of Revelation would at last be coming to North America for the first time, and now a pre-order bonus is making that release even better. No, it's not another art book, soundtrack CD, or code for an exclusive weapon. 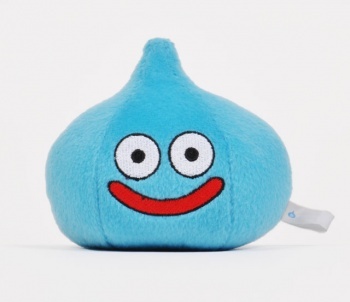 GameStop's website has revealed that the retailer will be offering a Slime plush to those that pre-order Dragon Quest VI. Other retailers aren't listing the plush at this time, but GameStop isn't calling it an exclusive either. The bonus is in contrast to the previous DS releases of Dragon Quest that didn't feature anything for pre-ordering (edit: scratch that, Best Buy offered a baseball cap for Dragon Quest IX). Also, it's a Slime plush. The Slime is an iconic creature from Dragon Quest, and JRPGs in general, that appeared in the very first title for the Nintendo Entertainment System/Famicom. It was actually inspired by creatures from western RPGs, but has become the mascot for the most popular JRPG in Japan. When players first enter a random battle in a Dragon Quest game, chances are that it'll be with one of these little blue globs of goo. They might be pushovers, but Slimes are necessary so that Dragon Quest players can build up their strength early on. Later, players will encounter variants of the Slime, like the King Slime that forms from 8 smaller Slimes, or the Metal Slime that is evasive but rewards tons of experience points. When it comes right down to it, nothing is more endearing than the original. Which is why Slime plushies can be tough to acquire. There's lots of Slime merchandise out there, but Square Enix's official store sells its Slime plushies for $25 and up depending on size, if they're not already sold out. The question that remains revolves around the size of GameStop's plush. It could be as small as a keychain, though GameStop has been known to give away larger plushies in the past. In the case of this Dragon Quest Slime, bigger is definitely better.